This will all be over in 53 days…and then we can start talking about 2020. It’s time to Get More Smarter. If you think we missed something important, please include the link in the comments below (here’s a good example). If you are more of a visual learner, check out The Get More Smarter Show. ► President Trump can start to panic now. Well, panic more, anyway. Manafort’s second trial was scheduled to begin next week. 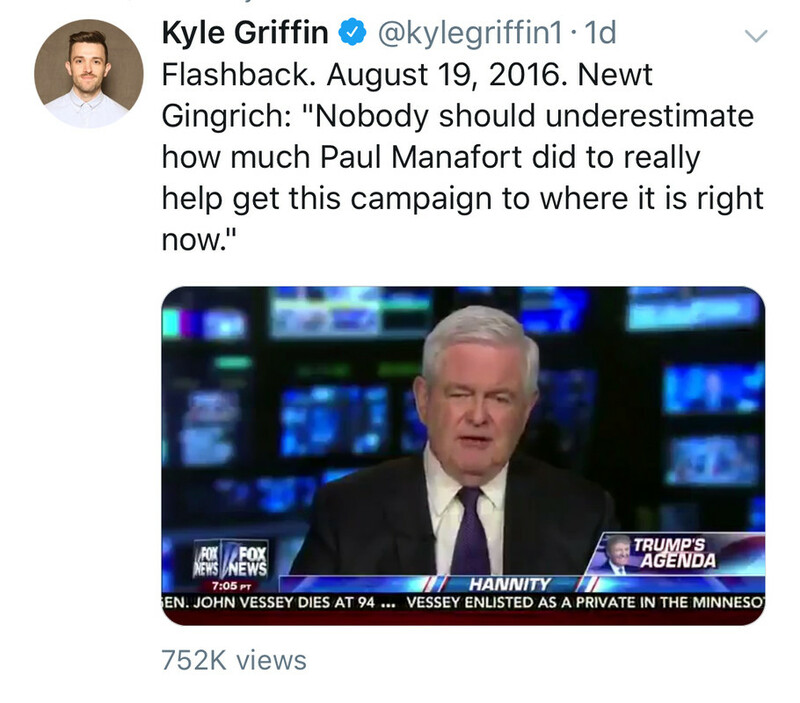 Instead, Manafort will plead guilty on two charges: Conspiring to defraud the United States and conspiring to obstruct justice. As Philip Bump notes in a separate story for the Washington Post, Manafort is now the fifth member of Trump’s 2016 campaign team to plead guilty to criminal charges. ► President Trump was widely criticized on Thursday for claiming that a reported death toll in Puerto Rico following last year’s hurricane is some sort of conspiracy by Democrats to make him look bad. In response, Democrats pointed to actual facts showing that they didn’t need to dream up any numbers in order to make Trump look terrible. Emails released Thursday by congressional Democrats show correspondence between first responders that appears to undermine the Trump administration’s public reporting of the human toll from Hurricane Maria last year. In one email, dated Sept. 29, 2017, a first responder — whose name has been redacted — describes “finding mass graves in mud slide areas,” and requests counseling support for federal first responders in the area. An unnamed Army National Guard general is included in the correspondence. Only 16 deaths were publicly acknowledged when President Donald Trump arrived at the island days later to survey damage and meet with local officials. That number climbed to 34 hours after he left. Independent researchers at George Washington University subsequently estimated the casualties at 2,975, a figure accepted by Puerto Rico’s commonwealth government. Trump, of course, has regularly crowed that his administration’s response to Hurricane Maria was a YUGE success. This is probably not particularly reassuring for people on the East Coast currently dealing with Hurricane Florence. Elsewhere, Blair Miller of Denver7 summarizes responses to Trump’s claims from Colorado’s Congressional delegation. Supreme Court nominee Brett Kavanaugh on Friday denied allegations made by a woman who reportedly said that he had held her down at a party when they were in high school in the 1980s and tried to force himself on her. According to a report Friday in The New Yorker by Ronan Farrow and Jane Mayer, the woman, who has asked not to be identified, described the incident in a letter that was sent to the offices of two California Democrats, Sen. Dianne Feinstein and Rep. Anna Eshoo. The woman claimed that Kavanaugh and one of his classmates had been drinking and turned up the music in the room they were in to drown out the sound of the woman’s protests and that Kavanaugh covered her mouth with his hand, the report said. Feinstein said on Thursday that she had referred the matter the the FBI. ► As the Colorado Independent reports, farmers in Colorado are concerned about efforts in Congress to significantly limit SNAP benefits (the Supplemental Nutrition Assistance Program formerly known as “food stamps.”) For obvious reasons, any reduction in SNAP benefits would hurt the bottom line of farmers. ► Signs of a failing campaign: You go to Sterling, Colorado for a meet-and-greet, and only two people show up. Thus is life for Republican gubernatorial candidate Walker Stapleton. ► Congressman Mike Coffman (R-Aurora) was never behind in any public poll while defending his seat…until 2018. A poll by the New York Times, made available in real time, shows Democrat Jason Crow with a significant lead over Coffman. This is the second public poll this year to show Crow leading Coffman in CO-6. GOP leaders believe they’ve found a way to thwart President Donald Trump’s latest shutdown threats: Send him a funding bill that’s impossible to resist. Capitol Hill leaders on Thursday announced a mammoth fiscal 2019 spending deal that achieves one of the Trump administration’s top priorities — the Pentagon’s first on-time spending bill since 2008. But there’s a catch. The same package also funds some of the government’s most sprawling agencies at levels that are billions of dollars more than Trump requested. And if Trump refuses to sign it, much of the government, including parts of the Pentagon, would shutter. “You effectively shut down the whole government,” Rep. Tom Cole (R-Okla.), a senior appropriator, said of the funding deal he helped shape. Spending leaders from both parties detailed the strategy for the first time Thursday, just 17 days before government spending runs out. The Senate is expected to easily approve the package next week. If this spending bill is approved, it would keep the government running for almost three whole months! In this scenario, the next funding deadline would be December 7. ► There is yet more evidence that President Trump’s trade war is causing serious economic damage in the United States. A congressional committee approved a bill Thursday that would permanently reauthorize the Land and Water Conservation Fund, a program Colorado outdoor businesses and conservation groups say is crucial to the state’s outdoor heritage. The U.S. House Committee on Natural Resources voted for a compromise that would renew the fund, which is set to expire Sept. 30. The Land and Water Conservation Fund, established by Congress in 1964, has funded trails, city parks, fish and wildlife habitat restoration and other projects nationwide. In Colorado, LWCF has generated more than $268 million for conservation and outdoor recreation projects since it began. The money has been used to acquire land or easements to conserve important fisheries and improve access to public lands, said Tim Brass, the Colorado state policy director for the sportsmen’s group Backcountry Hunters and Anglers. ► The Every Kid Outdoors Act made it over another hurdle in Congress. The bill would create a program to give fourth graders and their supervisors free entry to national parks and recreation areas. ► Colorado will still enforce methane regulations despite Trump administration efforts to roll back clean air rules implemented by the Obama administration. ► Karen Pence, wife of Vice President Mike Pence, visited Fort Carson in Colorado Springs on Thursday. ► Westword ponders the question of whether or not President Trump will come to Colorado to campaign for Republican gubernatorial candidate Walker Stapleton. ► Senator Cory Gardner (R-Yuma) says that American businesses were “afraid” to make investments when Barack Obama was President. Gardner likely earned himself a gold sticker from President Trump. ► The State Department spent nearly $58,000 on curtains for the New York apartment of U.N. Ambassador Nikki Haley. ► Actress Cynthia Nixon was thoroughly crushed by incumbent Gov. Andrew Cuomo in Thursday’s Democratic Primary in New York. Cuomo should cruise to a third term as Governor after beating Nixon by 30 points. Your kids. Your family. Your future. We will drown them all in a river of blood! I'm not certain, but I think 32 are contemporaneous to the occasion. The rest are more recent acquaintences. Perhaps Grassley was the ultimate Boy Scout. You know, "Be Prepared." You have to wonder what other stuff they have in reserve to counter any other potential scandals. It might not have helped Nixon, but it did lead to the defeat of 6 of the 8 IDC "Democrats" who've enabled State Senate Republicans. 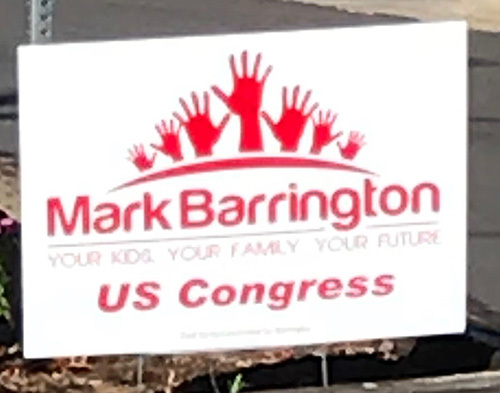 Barrington's logo on his website is, shall we say, more bipartisan-y. Who wants to bet me that there will be more women speaking up about Kavanaugh? Like men who hit women, men who impose their attention on women tend to make a habit of it. That’s a safe bet, cook. I’ll go further out on a limb and predict that Kavanaugh will be accused of assaulting a Native or Hawaiian woman, giving some background to his otherwise inexplicable animosity towards Alaskan and Hawaiian people. But will it change any GOP senator’s votes?